Welcome to Chef Brian Henry's official blogspot where you'll find occasional information about different events I'll be taking part in, information about catering, Ice-Sculpting, our cooking classes, various recipes and more. 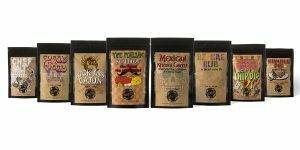 with our line of handcrafted rubs and spice blends! Enter our monthly draw to Win a Spice Pak from The Spice Co.
All you have to do is “Like” The Spice Co. on Facebook and submit a photo of what you made.